When purchasing a Violin there are so many option and prices it can be very confusing and daunting for the first time buyer…Ill try and shed some light on the subject. And where to purchase. the 3 Main places you will often encounter when searching where to buy a Violin. “Online” “Music Store” And “ViolinStore”. Buying a Violin online is kinda a risky purchase (I dont recommend it) unless you personlally know the shop or have tried the store’s or shops instruments. There are many “Online Retailers” Who will sell violins for $50 or $60 bucks and people will buy and bring to us and ask “Why dose this violin lose its tune?” (Pegs Don’t Fit) “Why doesn’t this violin sound right?” (Fingerboard and neck are wrong) “Why is it so hard to play this violin?” (Bridge is wrong)….It’s really more a toy then a instrument…Dont get me wrong i am not saying you can find a good instrument online, but you usually get what you pay for, you may save a few hundred dollars overall but you will lose out on the relationship with a violin shop or music shop, And the service, and also the trade in on that particular instrument, most store’s will give you some money for your older instrument if you purchased from them and need a better one in the future (We do this), Online retailers don’t usually offer this. I personally would never purchase i violin online, A picture could look great everything can look like it is good quality. then you get the instrument and you try to play it….Nothing works right the color and varnish is pretty but sound is terrible this is the case in maybe 70-80% of violin people will purchase online you have to know the reputation of the shop and that “Brand” of instrument, you have to find a shop you can trust then you can order online without worry,(We can even send a few instruments to you to try). Online purchase if you don’t know the the store or brand is a band gamble and one i wouldn’t take. Please don’t buy a $80 Violin you will be disappointed. Then there are places like “Craigslist” Or “Ebay” The best advice i can give is, if you can play it before you buy, Dont buy it yet! there are some good violins on “Craigslist” If you can play them and take them to a local Violin shop to get some advice then it’s ok to buy that instrument, When buying Online get a second opinion from You’re Teacher, Music shop, local repairman, Or even just someone who has played for awhile. Ebay Has some beautiful looking instruments, but most (Not All) i have tried or seen are just that A “Beautiful looking instrument” Tread with cation when searching online for a violin. Music stores can be a great place to find a beginning or advanced Violin,And many Music Stores will have very Knowledgeable staff (Sometimes even a skilled repair man), But if varies, some stores will carry only quality instruments but most will have some very low quality ones as well ..A Music store is just that, a “Music Store” Most don’t really know much about the instrument they are selling, and they not only will sale orchestra instruments they will also carry and sell, Band instruments and guitars…If you don’t have a local violin shop and don’t know anyone personally this is probably the safest way to purchase…(Unless from us of course)…Music stores can be great, you can find good instuments from some known maker’s what your losing out on is the sercive and expertise of a professional violin shop which brings me to # 3…. 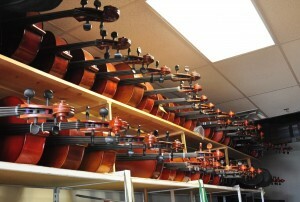 Violin store’s are the best place to buy a Violin, We only concentrate on what we know…We can build Violin from scratch, and do repair’s in shop with a fast turn around time….You will get a much larger selection, From Beginning students to seasoned professionals We have inventory for all and Prices for every budget. Most Violin store’s will have a Knowledgeable staff who can help with Your selection And a few player’s and experts on staff aswell. When you buy a Violin there is alot to consider, where its made, Quality of workmanship, Quality of the wood, Setup, Strings, making sure everything works together to bring out best sound…A Violin shop consider’s all of this and dose their best to make every Violin ready to sale….We will do the setup in shop, (Pegs, Soundpost, Bridge,Nut,Fingerboard,Strings) So that the instrument sounds and plays as it should, It’s very hard to learn on a violin that is improperly “Setup” But that is a discussion for another time..By far the best place to buy Violin,Viola,Cello or Double bass is your local violin shop.